There will be numerous mini-sessions happening this year at the Adobe booth at JavaOne 2008. I’ll be doing a “Building High Performance RIAs” session and a “The Open Source RIA Stack” session. Chet Haase will be doing a “Filthy Rich [Flex] Clients” session. Bob Tierney will be doing a “LiveCycle Data Services” session and a “LiveCycle and BEA” session. Duane Nickull will also be doing sessions. We also have one guest presenter, Igor Polevoy from Exadel, who will be demonstrating Flex and Seam integration with Flamingo. Igor’s session will be at 1pm on Tuesday. Other session times are TBD – so stop by the booth on Tuesday to pickup a schedule. Also, make sure that you come to the Filthy Rich [Flex] Clients session with Stephan Jansen (of Parleys.com and JavaPolis), Chet Haase, and myself which precedes the Adobe party on Wednesday night. Stop by the booth to pickup an invite. See you there! Pieter Humphrey of BEA has posted a great screencast about using the BEA Workshop / Flex Builder bundle. 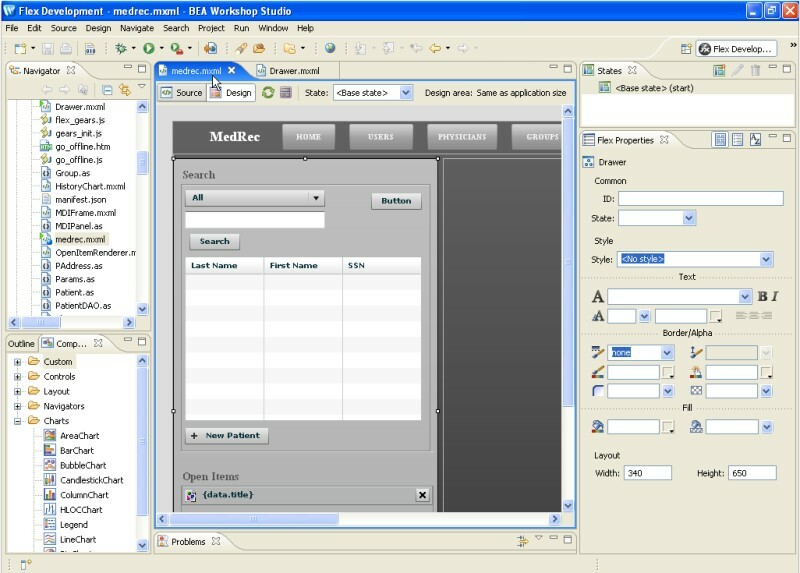 He goes through a very in-depth demonstration of using all the great features of Workshop and Flex to build a RIA front-end for the Medrec Patient Application. Definitely worth watching! Thanks Pieter for posting that! 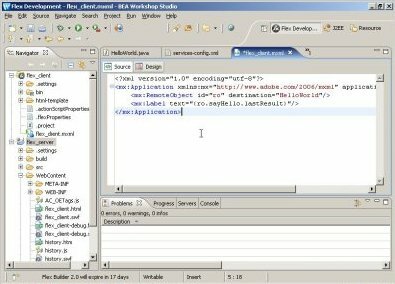 One of the most exciting Flex-related announcements in 2007 was the BEA Workshop and Flex Builder bundle. In case you missed it you can find coverage here, here, here, and a bunch of other places. It was big news! This was further validation that Flex is the standard for Enterprise Rich Internet Applications. As a long-time Java developer I’ve always respected BEA. They build solid software that is the backbone of many large and mission critical systems. Their stuff just works. And their development tools are no different. When we first began meeting with BEA about Flex it became evident very quickly how well the two technology sets fit together. With BlazeDS the stack gets even better. Also if you would like to purchase the Workshop and Flex Bundle check out Pieter Humphrey’s Blog for an amazing promo discount code. I hope that this combination of technologies allows you to build some amazing applications! Let me know how it goes.